The file Green Mars Terraforming Lightmodel v.0.5 is a modification for Surviving Mars, a(n) strategy game. Download for free. 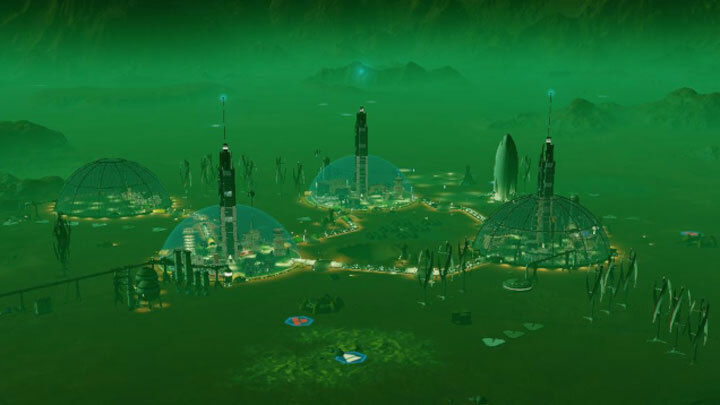 Green Mars Terraforming Lightmodel is a mod for Surviving Mars, created by mk-fg. Covers mars terrain and atmosphere with greenish bioluminescent microbiotic life. This is purely cosmetic (lightmodel) change, wait for at least 1 mars-hour to apply. Can be enabled/disabled via Ctrl+Alt+Shift+K ("Green Mars Toggle" in Key Bindings). Oh no! How could this happen!? Turns out some of the early martian probes weren't sterilized thoroughly enough back in 1960s. or atmosphere, got blown by dust storms all over the place and went exponential from there. So now Mars is a slimeball, same as Earth was for 80% of its existance (~3.7/4.5 bil years). light passing through it now has a nice purplish hue. (Re-)start the game, and it should appear in "Mod Manager" menu. Mod can be added and removed at any time, though green will stick around in saves. and uncomment "local lightmodel_list = 'TheMartian'" line there, load/save game and then disable/remove the mod. Only changes normal ligthmodel, does not affect gameplay at all. and freeze over to shiny crust during cold waves, but didn't test it myself yet. so be sure to disable it via hotkey before removing the mod, if you must. and uses full LightmodelList with a day/night cycle. Lightmodel should be recognizable to those who played with Inner Light mystery.